September 30, 2015 19:15 ET | Source: Rapier Gold Inc. Interpretation of data from the airborne magnetic survey flown in February, combined with results from previous field work. Follow up work on recent age dating analysis to further identify the local structure and fit the outcrops into the regional map pattern. Mapping and sampling program on a large outcrop exposed during mining at the Talc Mine Area. The outcrop is a previously known occurrence of Carbonate Rock which is cross-cut extensively by numerous quartz vein sets. This additional exposure has revealed more quartz veining than expected and sulphide mineralization has been observed during the mapping exercise. Selected areas have now been grab sampled and we are awaiting analyses. This large outcrop will be blasted and moved, by Imerys, as part of the mine plan and this material will be stockpiled separately to enable further tests to be conducted if initial sample results are positive. We have completed another brief visit to the Nib Yellowknife area (SW of the Talc Mine Area), to obtain additional grab samples and plan further mapping in the area in the next two weeks. Follow-up drilling of approximately 4 holes in the area of drill hole PG13-108 which intersected 13.0 g/t gold over 4.3 m just north of the talc mine pit at a vertical depth of 150 m.
Re-logging historic talc drill holes and incorporating these into Rapier's GIS database and integrating with the new geophysical data. As outlined in financial disclosure, the Company continues in discussions with various mining and exploration companies in the context of considering an option to joint venture on Pen Gold Project, as this might provide an attractive alternative to advancing the project. Many of these companies are seeking exposure to high grade projects, in low risk locations, with the added attraction of the Canadian currency and advanced infrastructure of the Timmins area. The Company has received an extension from Rio Tinto to complete the remaining technical work on Pen Gold North, there is approximately $100,000 remaining to be spent which will be achieved by completing the work outlined above, before December. The Company's activities are exclusively focused on exploring the Pen Gold Project, comprising approximately 16,400 hectares (approximately 160 sq km) located on Highway 101, 75 km southwest of Timmins, Ontario. Appendix A. The project is approximately 45 km southeast of Lake Shore Gold's Timmins West Mine and the newly discovered 144 Exploration Area. 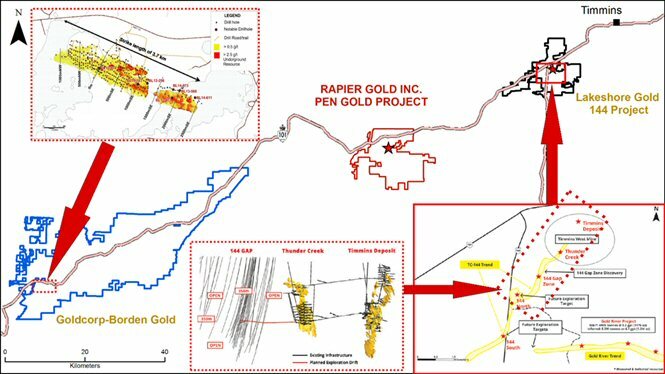 Pen Gold Project is located approximately 85 km northeast of Goldcorp's Borden Gold Project. Goldcorp acquired this project in the takeover of Probe Mines, on March 13 2015, for $526 million. Goldcorp are actively advancing the Borden Gold Project as a source of ore for the 11,000 tpd Dome Mill, located 160 km away in Timmins. Appendix A shows the locations of the 144 and Borden projects in relation to Pen Gold Project. The private placement financing, extended to October 30, 2015, is a non-brokered private placement of non-flow through and flow through units on a best efforts basis at a price of $0.05 per Non-Flow Through Unit (the "NFT Unit") and $0.075 per Flow Through Unit (the "FT Unit") for aggregate proceeds of up to $550,000 (the "Offering"). For further information see the Company's news release of July 15, 2015.